In my work, I'm always in search of plants with new, interesting and promising characteristics. 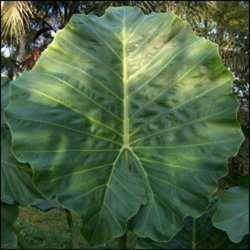 One I found in 2008 is Alocasia hypnosa, a plant I had known of previously, but had thought difficult to grow and to find. Not only is this plant much easier to grow than I had thought, but it had several very intriguing characteristics. So intriguing, in fact, that I began to wonder where this plant really came from . . . This Spring, while in search of new candidates for my hybridization work, I happened upon a mail order nursery that had a plant they called Alocasia 'Maechang'. The picture on their website had a familiarity to it that I couldn't place immediately, but since it was unusual and didn't look like a plant I already had, I went ahead and ordered some of them. The corms I received were of generous size and some were already beginning to sprout. One look at them and I felt that I had something new, so with anxious anticipation, I potted them up and waited for the day when leaves would unfurl. The wait was not long, and once I saw the first emerged leaves, I knew I had healthy and large specimens of the plant I knew of as Alocasia hypnosa. I had seen this plant before only once, and then as only a small specimen. I had never seen it bloom, but had been told that it was the only Alocasia species that produced underground runners or stolons. This type of growth I had not actually seen on one of these plants. After the first couple of leaves, I got my opportunity to see the blooms on this plant (see photo, left). 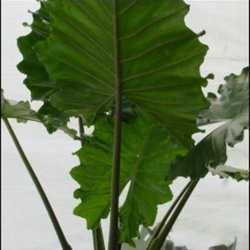 Alocasia hypnosa was described as a new species from Yunnan, China in 2005. The discovery was published in Ann. Bot. Fennici 42:395-398 by Yue-Hua Wang, Jian-Tao Yin, and Zai-Fu Xu. They describe the plant as being allied to A. odora, yet differing in several significant respects. In growing this plant myself, and observing the blooms up close and personal, I can state that those blooms are very unlike those found on my A. odora. In fact, I was struck by how similar they were to blooms I've seen on certain Colocasia species. Then, when I saw the stolons, or underground stems, that these plants produce, I realized another similarity between those and ones I've seen on other species of Colocasia. However, the defining discovery, for me, was when I found that the blooms produced no pollen at all. Without pollen, I could not even self the plant to see if it would come true from seed! My mind started working on this enigma of a plant, frustrated by the fact that I could not hybridize with it, yet fascinated by the apparent mix of Alocasia and Colocasia characteristics in one plant. The absence of pollen suggested to me the possibility that this was a natural hybrid between a species of Alocasia and a species of Colocasia. The description of the plant provided in the reference above mentioned the fruit or berries produced, but did not make mention of pollen. Also, I've seen some species of Colocasia exhibit seasonal dormancy when conditions became too dry for them to keep growing, but on return of wetter conditions, they would resprout from corms. This plant has that same characteristic, but even more so, going dormant in winter whether conditions are favorable or not. I consider this characteristic to be a plus for would-be tropical growers in northern zones, as they can have the tropical look of this plant in summer, then store it safely as a dormant corm in winter. I haven't given up on this plant as a possible parent for some new and exciting hybrids. Perhaps next blooming season, I'll be able to find some pollen on one of the blooms . . . 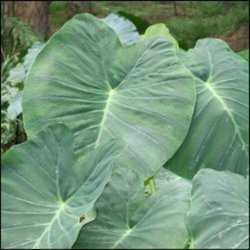 If you wish to try growing Alocasia hypnosa, they can be obtained from Buried Treasures.